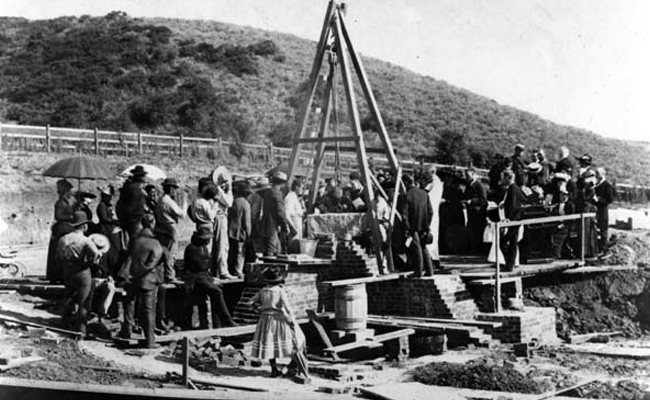 As the cornerstone was laid on Easter Eve, April 20, 1889, the Church of the Angels was forever cemented into the history of Pasadena. Designed by renowned British architect Arthur Edmund Street, the structure was built as a memorial chapel for the owner of the historic San Rafael Ranch. And as such, the church was never designed to house a large congregation. But it was the perfect size for the movies. As far back as the 1920’s the Church and surrounding property were a featured destination for Hollywood filmmakers. But it was in the 1944 film "Since You Went Away" that the Church of the Angels became a star. Produced by David O. Selznick and starring Lionel Barrymore, Claudette Colbert, Joseph Cotten, Robert Walker and Shirley Temple, the film put Church of the Angels on the map. Over the last 100 years, the Church has stood witness to marriages and funerals, fights and foot chases, baptisms and crucial civic events on both the large and small screen. In that time, FBI agents stalked and apprehended a deadly killer on an episode of the X-FILES, Jim and Pam baptized their baby on THE OFFICE, and President Bartlett cast his vote on THE WEST WING. As film and television production boomed, the music and commercial industries have followed. The Church has drawn the likes of keyboard powerhouse Roland Instruments, The Killers, and even Mick Jagger. The Church of the Angels has served as a partner of the film, television, music and commercial entertainment industry. And that partnership has enabled the Church of the Angels to thrive as an community of faith and maintain our historic presence in the community. We look forward to helping you tell your story in this beautiful location!